Published: Jun 30, 2010 to ? 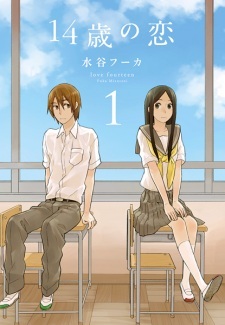 14-sai no Koi has been published in English as Love at Fourteen by Yen Press since December 16, 2014. 14-sai no Koi is a manga that revolves around two 14-year old childhood friends turned lovers, Kanata and Kazuki. Both respectively seem to possess an aura that prevents the opposite gender from approaching them, and admired by their friends as being "mature" for their age. Needless to say, when they're alone, they cast off their "personas" and reveal their true nature- and their actual relationship. The story is light, comedic, and... it's really light. The situations aren't exactly unique, but the comedy doesn't make it feel cliché at all- the focus is on the blooming love, not so much on the whole "persona" thing IMO. My only comment is that I wish they would elaborate more into these little snippets we get- each chapter is roughly ~20 pages each, so I think this manga would be better read once all the chapters are released. Idk, waiting periodically just for 20 pages for this kind of a manga doesn't seem worth it :P.
Art-wise, I was honestly expecting more judging from the cover art I looked at prior to starting the actual story. However, as I read further, I began to appreciate it- it's clean, consistent, and cute. The facial expressions of the characters are well-drawn by the mangaka and I especially like cute little Nagai-kun! Haha. As for the characters, I must say I'm impressed by some of these characters. They share traits I didn't quite expect to see in a manga based in a middle school setting. [Not to spoil anything] but... let's just say I was surprised who gets a rival! Also, these odd characters make everyday scenes entertaining. Hmm... as for enjoyment, I enjoyed it. Do I need to elaborate on this further? It's a refreshing look at young love. I read it and I remember my childhood. Anyways, I'm going to conclude by saying: stop reading my review and get to reading the manga !! Actually i was looking for a funny manga when i accidentally saw this 14-sai no Koi's synopsis and noticed there's something wrong with the chapters. But honestly, i kinda satisfied i found this manga, because it's really enjoyable to read and has its own fun parts. Well, this manga story is about a couple junior high school that forced themselves to act mature at school, Kanata and Kazuki. But at the time they're both alone, they showed their childish and weak side to each other. At first, i thought the story would be focused at how they keep their act at public, but i was wrong. It dominantly told us about their romance story and how the story developed. The story is very light and seems to be enjoyable to be followed. The unusual parts is, this manga has a lot chapters with decimal number. You know, like chapter 18.5 and 21.5 (i don't know what it is called) and this is what i was talking about when i said there's something wrong with the chapters (imagine this manga already had 54 chapters, when the main story's still reached chapter 23). Even with this odds, but i like it since they're funny and still told us about the main story. Even though this story's premise is about a 'mature' couple at first, but the story is not always about them. It's also told us about some romantic development of other characters, like a delinquent who fell in love with a teacher, or a transfer student who put its attention to some beautiful stranger, etc. I gave the story 8. The art is not bad, even though it isn't looked like nowadays mangas. I gave it 7 for the art, since it's still enjoyable. The characters, like i said before, this manga isn't just focused on the MCs. I gave 8 for it, since almost all of the funny parts was because of the character's personality. And of course, i enjoy reading this manga. Overall, i gave 8 out of 10 for this school romcom story. If you are looking for some school-life romantic scenes, i recommend this manga. I just couldn't get into this manga. For starters, each chapter is pretty much a self contained story and each one is incredibly short which means not very much happens. Then there is the entire premise that for some reason these middle school students can't reveal that they are dating or that they like each other - unless there is a law against this or this is back in the early 90's in Japan, I don't see how anyone would really care. There's literally no reason ever explained in what I read that makes any sense here. On top of that, there's no real overarching plot that draws you in. Each tiny chapter feels more like a chance to put up a few pages that supposedly leads to an "awwww" moment or something, but most of them are cutesy rather than romantic and few of them have any sort of emotional impact at all. Honestly, I feel like this is the manga equivalent of girls looking at pictures of cute puppies or kittens on the internet and probably not worth wasting your time over unless you really enjoy that kind of stuff. 14-sai no Koi is best described as spring. The art style, the story, and the characters all give off a warm, new, clean spring-like feeling. The story gives the air of simplicity. There's not a lot of angst - which for romance lovers can be a breath of fresh air from the usual. It's heartwarming and it's tender. It's a young love that isn't just "kya! my first boyfriend! I'm too shy to even look at them!" It's two friends who really like each other and how their feelings for each other grow and evolve. It's also not a masterpiece. It's not the greatest love story of all time. But it's definitely enjoyable for a break from the angsty love triangles that many romances seem to have. As for the art, I'm personally a huge fan. I think it suits the theme of the manga very well. It's minimalistic, but I've always said that less is more. Which brings me to characters. There's no ground breaking character development, no real extremes one way or another. But the mains are likable, the side characters get developed alongside with the mains. I find the characters endearing. I'm cheering for each of them to find happiness. That in itself is good story telling I think. In conclusion, although I love this manga series, I recognize that it's not going to be for everyone. I think it's the type of series to be most enjoyed by those who want a relaxed romance or something to comfort them after watching something heartbreaking or gruesome.